It’s clear that starting up a business is no easy task: the initial costs, heavy lifting and administrative duties alone are enough to overwhelm a business owner. Yet, a huge pain point centers around whether or not you should do these tasks yourself or consider outsourcing them. While it may not seem like a priority to establish HR practices, payroll options and workers’ comp insurance, it is essential to long-term business success. 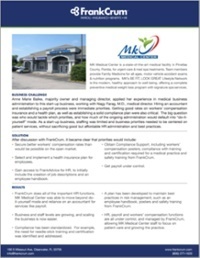 Our case study with MK Medical Center shows FrankCrum’s skill at providing quick and cost-effective solutions which solved the facility’s start-up challenges. We have a variety of solutions that can work for your business regardless of size, industry or budget. With FrankCrum, you can have access to FrankAdvice for HR and get one-on-one attention to your business’s needs. Simply put, we are a dedicated team committed to building customized HR solutions for you and your business!